With the retirement announcement of Lyin' Paul Ryan, who would rather slink away than face defeat by Randy "IronStache" Bryce, the Wisconsin GOP was thrown in disarray. All of a sudden, their front runner was Paul Nehlen, a white supremacist who was too far out for most of the alt-right, including Steve Bannon. They had to scramble to get someone in there that won't embarrass them as has happened so often in other states. Thus they came out with Bryan Steil. Steil is a well-connected Republican from a long line of well-connected Republicans. To make it better for them, he's an unquestioning establishment Republican that will mindlessly promote the same agenda that Ryan was pushing. Unfortunately for Steil, despite his carefully laid plans, he has not had a stellar start. Just like Ryan, he keeps getting caught up in his own lies while doing the Trump Two-Step. But the similarities doesn't end there. Steil is a natural born liar as well. 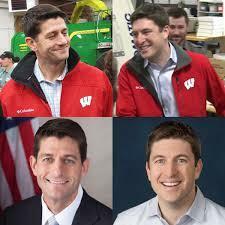 Steil prefers to call himself a former legislative aide to Ryan, but in reality, he was Ryan's personal driver. Steil had been bragging about raising $250,000 in just the first few days after announcing but in reality, he's been courting the big time Republican donors for a while. One check from the Bradley Foundation, the Koch Brothers or any of the other ultrawealthy could easily explain that amount of money. Bryan Steil has spent the last nine years working in manufacturing in southeastern Wisconsin and has seen firsthand how Washington limits economic growth. That's when reality raises its ugly head again. One of the companies that Steil worked so hard with to create jobs was Regal Beloit Corporation, who moved good paying jobs out of the Midwest and into Mexico. But there's more. There's always more. Steil still has to answer for being a regent for the University of Wisconsin which has seen a massive decline in their budget and subsequently the quality of the school system and his support for Trump's agenda, among other things. Perhaps Bryce should make the same offer to Steil that he did to Ryan - send Steil to work the iron and learn what it's really like for a blue collar worker while Bryce goes to Washington to do the really hard work of fixing all the damage done by Ryan. Meanwhile, don't forget to give something, anything, to help Bryce keep up his momentum in fighting the big special interest money that Steil is already raking in.